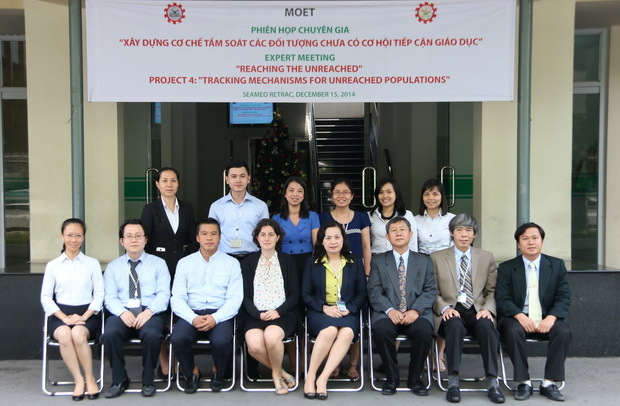 SEAMEO RETRAC as assigned by Vietnam’s Ministry of Education and Training hosted the Expert Meeting on December 15, 2014 at the Center’s premise. The meeting was the first stage of the Regional Project entitled “Tracking Mechanism for Unreached Populations”. Attending at the meeting were the experts coming from UNESCO Bangkok, Thailand; Ministry of Education and Sports, Lao PDR; Mr. Nguyen Cong Hinh, Director General, Department of Regular Education, Ministry of Education and Training, Vietnam; and SEAMEO RETRAC Management Board and Project Management Team. The meeting focused on establishing the tracking mechanism for unreached populations in education.